Caught this on BBC news being shown on the Heathrow Express a few weeks ago. It’s the future. This entry was posted in fun on June 30, 2009 by Steve Coast. 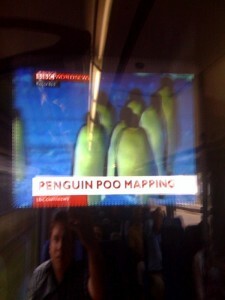 Penguin poo can be seen from space. They’ve found new colonies of Emperor penguins with this, thankfully, remote sensing technique.